Yesterday evening(December 5th) Natalie Portman and Raffey Cassidy hit the red carpet for the premiere of 'Vox Lux' at the Arclight Theater in LA. Natalie Portman may have worn all black but she sold me on her CHRISTIAN DIOR SPRING 2018 COUTURE power suit. On the runway, the satin suit was layered with a sheer organza shirt underneath but Natalie opted to go bare chest which added a sultry appeal to her look. The bold red lip added edge which topped off her look along with side parted straight tresses and black sandals. 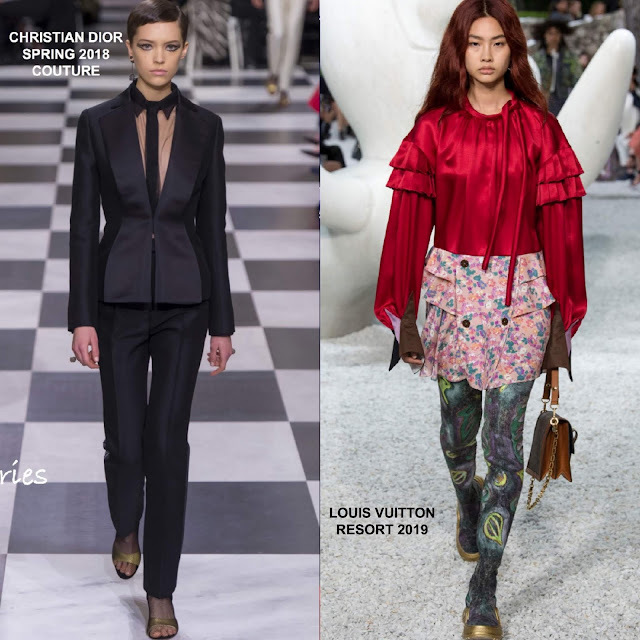 Raffey Cassidy rocked a retro inspired look courtesy of LOUIS VUITTON. Her RESORT 2019 red ruffle silk & tie neck blouse and floral mini skirt was styled perfectly with white ankle boots. A pulled back ponytail and gold hoops finished up her great look.